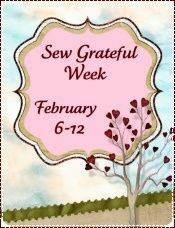 Cation Designs: The Sewing With Cats Blog Award! And if you're thinking, "Gee, I've never heard of that award before," it's because I just invented it. And I'm awarding it to myself. Yup, I'm that full of it. Also, Walnut made me do it. I've been seeing a lot of blog awards floating around lately on some of my favorite sewing blogs: the Versatile Blogger Award (for, I imagine, bloggers who blog about multiple things? 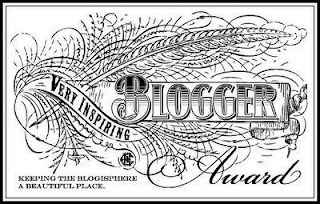 ), the Leibster Blog Award (for blogs with less than 200 followers), and the Sunshine Blog Award (for bloggers who bring sunshine to the blogiverse). I myself am grateful to have been nominated for these, and while I'm really bad at coming up with the required list of new bloggers to nominate (I totally blank out at the moment even though I love so many great blogs out there), I do love the intention behind them. Only...I just keep seeing the same ones circled around, and then newer bloggers might not know older bloggers (as in blogging for longer, not necessarily closer to death) have already received that award...so what better solution than to create a new award that nobody's ever heard of before! 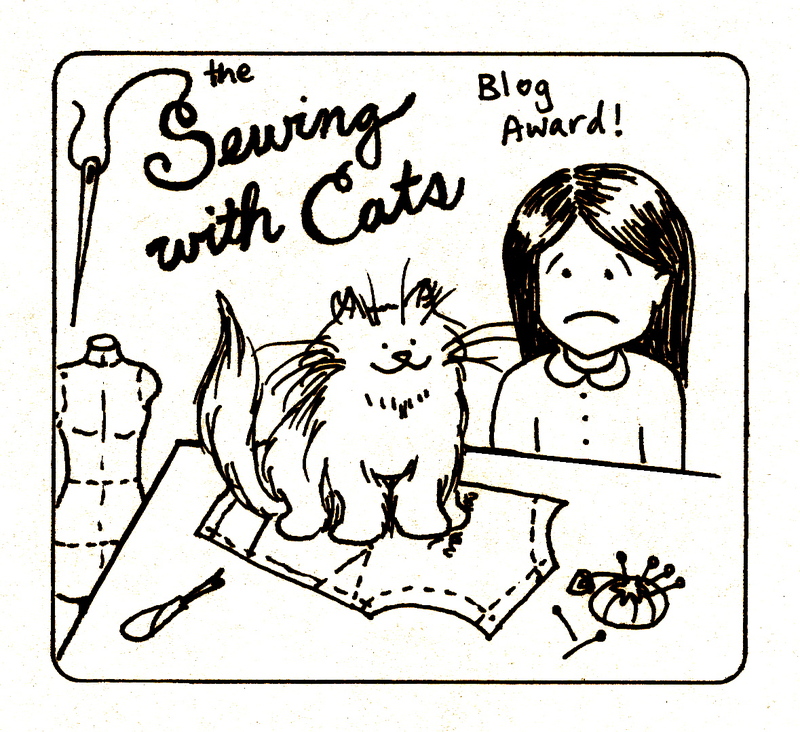 So why does Sewing With Cats deserve an award? Well, as all you who do actually Sew With Cats know, managing to make garments with those tricky felines around is quite difficult sometimes! Cats love getting all up in your business, whether it be on the fabric, the patterns, or the notions. I am pretty sure every single one of my sewing patterns has been lovingly warmed and crinkled by Walnut at some point. And once the garment is actually sewn up, it's tricky keeping them cat-hair-free long enough to get a good photo, and even then a stray tuft is likely to drift into the frame right as the picture is snapped (at least, if you have an ultra-downy long-haired cat like Walnut; those tufts are like dandelion seeds or Charlotte A. Cavatica's baby spiders: made to catch the wind). There are quite a few bloggers out there who I've seen consistently produce fabulous work, unhindered (mostly) by their feline helpers. And they deserve to be recognized. Now, I hold no delusions that this blog award is actually going to be passed around, but I'm going to go ahead and award it to some deserving bloggers and make up some rules about it. Mostly because I am just nosy and want to know the answers to these questions. 1) You don't even need to thank the person/cat who gave it to you. Heck, give it to yourself if you sew with a cat and I don't know you/it. Reason for this being, cats realize they are superior beings and never deign to thank you even if you've been scritching their ears for an hour and your arm feels like it's going to fall off. 2) Nominate an arbitrary amount of people for this award. Tell them about it if you wish. Or don't wish. Or wish for five minutes, then suddenly TURN AROUND AND SNAP AND NO I DON'T WANT TO BE SCRITCHED ANYMORE. When did you acquire your helpful feline assistant? Was he/she immediately helpful, or did it take awhile? What is the average amount of time elapsed between when you start a project and when something gets helped with? What is your helpful feline assistant's favorite/weirdest thing to assist with? How do you decline said assistance without losing your arm? 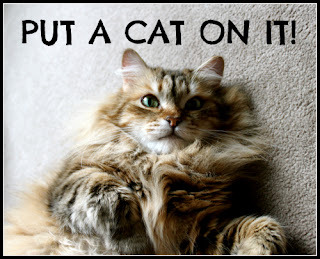 What's the worst thing your helpful feline assistant has managed to botch up? I'm imagining shredded chiffon, snagged silks, etc. Are you ever afraid to post too many pictures of your helpful feline assistant on your blog, for fear of being labeled a crazy cat lady? Anyway, without further ado I nominate Gertie of the Blog for Better Sewing, Elaine of The Selfish Seamstress, Jessica the Stitchy Witch, Leah of Struggle Sews a Straight Seam, Devra of Puu's Door of Time, Leimomi of The Dreamstress, Amy of Sew Well, Aleah of No Time to Sew, Debi of My Happy Sewing Place, Tina of Down the Retro Rabbit Hole, and Esz of Kitty's Drawings. Congratulations on producing top quality garments with cats around! 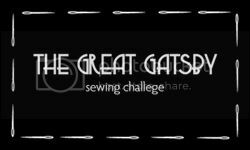 And now I'll confess that I don't even know how to go about informing someone of Gertie's caliber that hey, I just made up a ridiculous blog award and I want to give it to you even though you have way better things to do with your time than write about sewing with cats, you know, things like teach that Craftsy course about tailoring a suit. Oh, the dilemma! *sigh* I'm just a crazy cat lady who sews all the time and can't stand children, and thank goodness I've got a life or even I would be concerned about me. Then again, maybe I haven't got a life. Because this is most definitely me at parties, except that I'm sober. Blurry, because he just dived across the fabric (and left a tuft of fur). My own fat cat on a mat, looking particularly leonine with his mane and coloring. Also, for the record, he's not actually fat; he's just exceptionally long-haired. Lest you think that I'm just a biased owner, I looked it up, and he is actually on the lighter side for a Siberian male. Then again, that might be because he's neutered. Okay, I'm going to stop projecting body image issues onto Walnut. I think this is a great award! Tragically, we had to surrender our cats when we moved out here five years ago (to my father, who has since passed them on to another friend), so I never really did much Sewing With Cats. /sniffle. Awww so sad to have to give up cats :( Although, I'm pretty sure that Sewing With Kids deserves an even bigger, better award. I'm glad you like my hand-drawn badge (I'm hopeless with photoshop), especially since you are a draw-er too! OK, first I was going to say this is my favorite blog award ever (and your art is so much awesomer than the other blog award graphics I've seen). Second, I agree--can I get an award for Sewing with Cats and Toddlers? (well, Cat and Toddler). I have actually had to have my sewing machine foot pedal cord replaced twice due to cat destruction. That looks sarcastic, with the sad period at the end, but I mean it sincerely. This is hilarious! Glad you find it hilarious! And I myself am guilty of the sad period when inside, I'm thinking !!!. oooohhh yippeeee! This may be my favourite blog award!!! I can't tell you how much I loved this post and my god, you found a cat poem by Tolkien. Awesome! I was so excited when I found that cat poem in my Tolkien poetry book! It doesn't seem like the kind of thing he would write, what with all the grandness in LOTR. Actually, on second thought, it seems like a hobbit fireside poem. So honored that you don't think this blog award is silly! Such a fun award idea! Cats are definitely the best sewing helpers and I love the idea of posting poems this month too. Spot might have to jump in and steal this award to give to my mom's cats (and herself of course)! 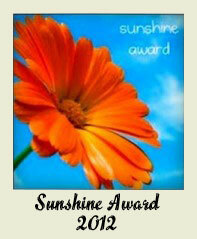 Please do post poems and give out this award to others! I love discovering new poetry and new sewists with cats. Cats are just so easy to characterize, despite each of them being different. Hahahahaha! Brilliant. 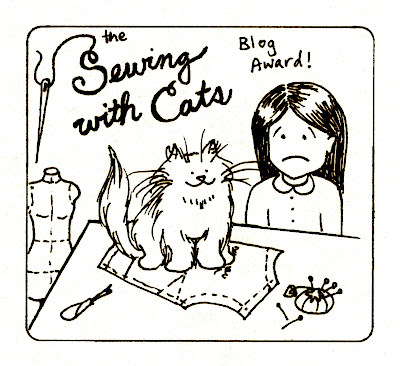 There do seem to be an awful lot of sewing bloggers with cats, which I really enjoy. Thank you for including me. I accept your award with great enthusiasm. I've never known anything other than sewing with cats, but I can attest that my cats want to stick their nose into everything crafty. One loves patterns and will run and slide across them just when I have them neatly and precisely laid out on my fabric (using expensive fabrics makes me tetris my pattern pieces to get the most out of each piece). The other loves every other detail of crafting, especially my French curve. He will attack it whenever it comes into reach without fail. I was hoping to get into drafting my own patterns, but it's hard when he's constantly attacking my tools! He also gets really close to my scissors and sewing machine and makes me very nervous for his whiskers. I'm a slow enough sewer already without having to pause to make sure he's out of the way! I wouldn't have it any other way though. And, I'm always glad to see Walnut sneak into your photos! Your cats sound awesome, and I'm not just saying so because one of them is related to Walnut ;) I am always nervous about Walnut's whiskers too! The worst a cat ever did to me sewing-wise was suddenly freak out because of imaginary dust motes or something invisible to the human eye, tearing out of my arms and leaving a big rip right in the front of my blouse. That I had just worn for the first time. And had no leftover fabric to recut. sigh. Like I said to Tanit-Isis, Sewing With Kids deserves its own award. Those sudden freakouts are what I'm most afraid of...thankfully Walnut hasn't had one on my fabric yet! Cats are so much cooler, indeed! 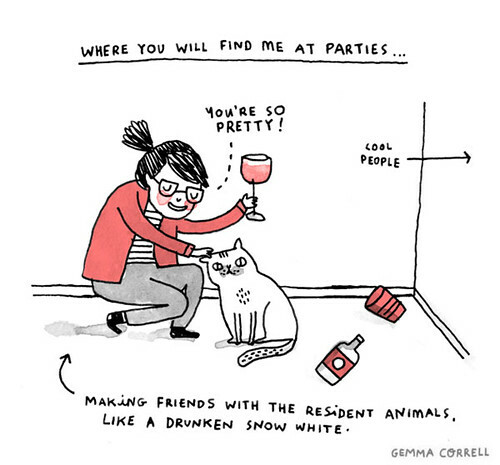 Glad to know I'm not the only one in the corner with cats at a party! This is awesome, and I can't believe you found a Tolkien cat poem! Can there be a cooking with cats award? ;) I guess I don't really cook with the cats, though -- they've learned somehow to stay away from the kitchen, lest something hot drip on them. It was in my Tom Bombadil collection! Walnut hasn't learned about staying away from cooking, possibly because his fur is so thick he doesn't feel things drip on him. I love your Award so much that now I wish I had a blog... and a cat... so that I could be awarded it! I have subscribed to your blog. I don't want to miss a hair of your cat. Or your crafts. Or your wit. :-) Thank you for making me smile! Aaahhh, I'm so honored! The Orange Terror and I thank you heartily (and he bats a bobbin off the table for you). I will have to use this as an excuse to post a non-blurry picture of him on the blog... if I can take one. My cat-sewing-menace is of the fast-moving, knocking-things-down variety. Also, can I create an award for best blog award art? If so, I award it to you. Cat smiling, Human frowning is so perfect! Aww thanks! And here I was thinking that my hand-drawn blog award was kind of lame compared to "real graphics." I can't wait to see a good picture of your orange terror! My parents have one at home, too...what is it with orange cats? Awwww....this is awesome! It's even better than the Zombie Chicken award that I have long coveted. Thank you so much! You're welcome! I love seeing Felicity pop up on your blog! You're welcome! I get excited every time I see Boofy show up in your pictures...he reminds me so much of Walnut with his long hair! Good luck with your secret projects! 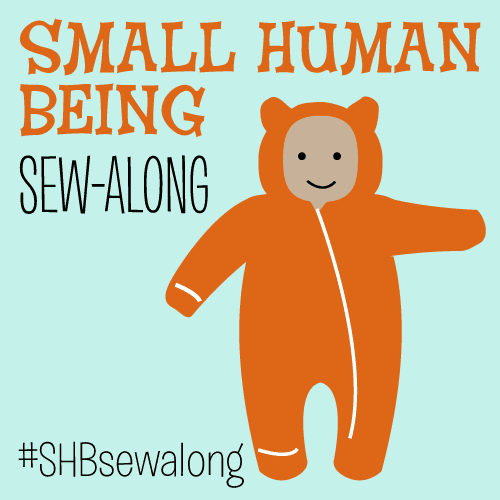 Your sewing creations are fabulous and Walnut the Siberian is adorable. Our two Norwegians are always all up in my sewing business too, but they're cute to have around. Ooh, I claimed one, on behalf of one of our regular bloggers. Thanks! Nice idea, and I love what you did with the 1912 pattern! Hello, just wondered if you'll be doing the awards again as I'd love to get nominated (or even, maybe, win?!) I'll be posting about it on my blog very soon in the hope that someone out there might give done credit to my two cays Mini and Merky - they secretly make everything that I claim to make, I just take the credit because they're computer illiterate (but they can work wonders with the sewing machine I tell you!). Please vote for me! I just discovered this and I am actually laughing out loud. Best blog award ever, maybe? Our cats sort of look alike. Although yours might be fluffier, which I didn't think was possible. 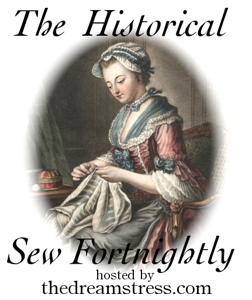 I find it interesting that the majority of sewing and knitting bloggers are also "cat enthusiasts." (I am hesitant to use the phrase "cat ladies.") I wonder why that is. Someone should look into it. Yes, please give yourself the award and nominate Erica too! 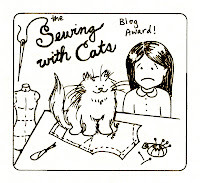 This award is meant to be seized and not necessarily requested, because I don't know who has cats out there in the sewing blogosphere. 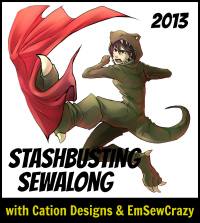 Congratulations on sewing with cats! Kitty is getting ready to accept his kindly given award. I am waiting for a gift I received from a giveaway and will combine it with that post. By the way, your cartoon is sooooo funny! And sooooooo me!! Has been all my life, I recall parties going on, and me with the ferrets and fish and cats and dogs in the other room, hanging out :). That Gemma Correl must be living my life! lol. I will have to 'lift' it for the award acceptance ceremony on my blog. 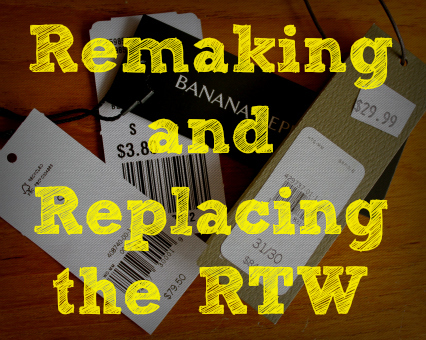 Four Sew Weekly Challenges in One Dress! Finished Elizabethan Pair of Bodies!